Rupert Pupkin Speaks: Arrow Video: FOXY BROWN Blu-ray ""
From the opening strains of Willie Hutch's fantastic theme song through the film's dynamic credit sequence(which Greg Mottola may have cribbed from for SUPERBAD), you know that FOXY is gonna be a fun time. Tarantino has always aptly said that Jack Hill was von Sternberg to Grier's Dietrich and this film was their fourth collaboration. This was their followup to the outstanding COFFY, which was the first Grier movie I ever saw I think. Pam Grier is, to me, one of the sexiest ladies in all of cinema and she looks positively radiant here. A d as she was in COFFY, Grier is after drug dealin' folks again in FOXY(which is a sort of paraphrased remake of the former). As she's quoted as saying here, "Vigilante justice is as American as apple pie". Foxy's boyfriend is a federal cop who has had facial reconstructive surgery after a run in with a local drug syndicate. The syndicate is still out to kill him to prevent him from testifying before a grand jury. As in COFFY, Grier has to infiltrate a prostitution ring to get to the drug people. Sure it's pretty much a retread, and a retread lacking the amazingness of Robert DoQui's King George the Pimp, but it's nonetheless entertaining. It also features a quite memorable scene with an afro and a gun. Overall though, FOXY BROWN is the somewhat more mean-spirited cousin to COFFY. 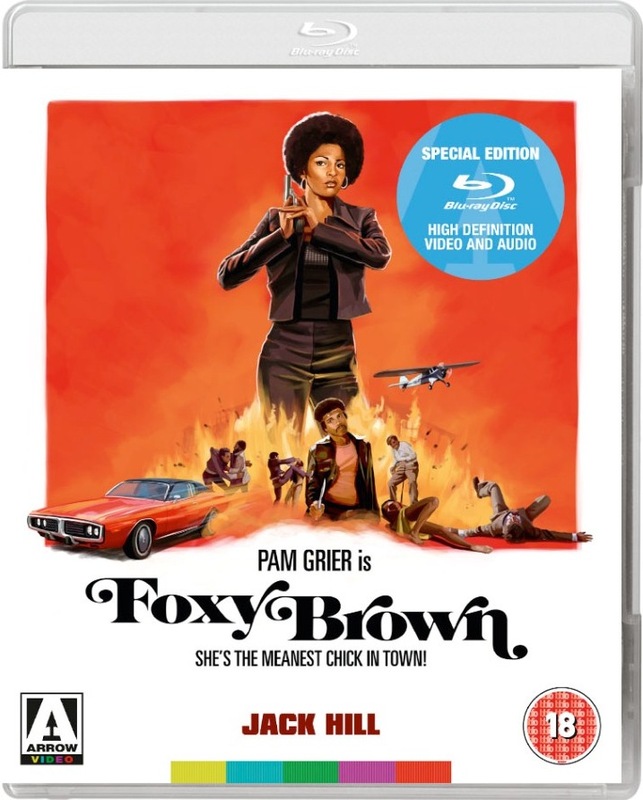 As dark as COFFY gets, I feel like FOXY goes a little grittier(though both films have a good amount of exploitation 'grit'). It's a pretty physically demanding role for sure for Ms. Grier and she stands up to it quite well. Also among the cast with Pam is Jack Hill regular Sid Haig. Haig and Grier did many films together and it's always a pleasure to see them sharing a scene. Sadly Haig only arrives in the last 15 mins of the movie, but some Sid is better than no Sid. Overall, a decent entry in both Grier's and Hill's filmographies, but they've both done better. The new Arrow Blu-ray transfer looks nice though, plenty of "pop".